I am a Doctoral candidate at Ocean Seminary College and am conducting a research study on spirituality and the performing arts, titled "Encountering the Other in Theatre/Dance: a Model for Body Theology". I am inviting YOU to participate in my work! Your answers as a director, choreographer, dancer, or actor will really help me create the bulk of my dissertation! I need your experiences! To join, just think of a time that you, as a performer or someone guiding performers, encountered the Other in: THE AUDIENCE, A CHARACTER, YOUR DIRECTOR/CHOREOGRAPHER (While this is geared towards performers, directors/choreographers/designers should feel free to adapt the questions to their own experiences. ), YOUR SCENE PARTNER/ENSEMBLE, or YOUR OWN BODY. I have easy links to Google forms that you can complete! Just drop a comment here or a DM about which form you would like and I’ll send you the “official email” with all the “official language”, and the link! Lessons from my Time in Theatre. Originally published 3.17.18. 2010. Hedgerow Theatre. Rose Valley, PA. I had choreographed the carol dances for A Christmas Carol. I researched on English country dances (think: Jane Austen), and set one for the Fezziwig ball and one for the end of the show. I had only been at Hedgerow a few months, being brought in to choreograph the world premiere of An American Tragedy. Penelope and I hit it off, she liked my work, and I agreed to do the season: Oliver!, A Christmas Carol, Godspell, and something else I’ve forgotten. I fell in love with the theatre- with the people, the life, the stories. I found people who understood my love of literature, my desire to make art, my need to connect. I went to rehearsals when I wasn’t needed just to be a part of that world. In doing so, I learned the art of directing from watching Pen, the art of acting from watching my friends and young students, the art of connecting from watching a company put all of the elements together for a receptive community. One day, I realized just how much I had learned- on Christmas Eve, an actor didn’t come to the show. It was a small role, a solicitor, visiting Scrooge. And I was confident I had absorbed the lines, if not the character. I volunteered to go on. At first, the others laughed. I convinced them I was serious; I believed I could do it. I was a performer, after all. How hard was talking on stage, when I could dance en pointe?! So, I did. I did just fine. And, from that moment, I was an actor as well as a dancer. I knew it, Penelope knew it, and so did the rest of the company. My start in theatre came through dance, as a member of the creative team. I loved watching something I created take a life beyond my vision and my teaching and become a part of something bigger. My start as an actor came through necessity and urgency. 2018. Curtain Call Playhouse. Pompano Beach, FL. This past weekend I was reminded of this beginning. I got a phone call while I was drinking my coffee on Sunday morning. A hit-and-run accident the night before had left an actress in the company I am a part of with a concussion. It was a role I had read before; could I please read in for the matinee performance? Capable of making good, instinctual choices- like those displayed in a cold read at an audition. This was the case for me. I had read the role in an audition, but then withdrew myself from consideration because of a conflict with the show dates. My audition read was memorable, and enough of what the director wanted, that she trusted it, and me, in performance. Works well others- cooperative and supportive. A cast that has rehearsed together ideally becomes a family. If a member of that family is injured, or has to leave for some reason, it is traumatic. The rest of the cast is worried about their friend and worried about their show. Someone who comes in must compassionate and competent. She should help to ease their worries, at least about the show, not add to them. Because her focus is on the show, and supporting the cast, she isn’t caught up in her own ego. Deals with stress well- Reading in to a show is stressful for the new actor and the rest of the cast and crew. Cracking under pressure is not advised. 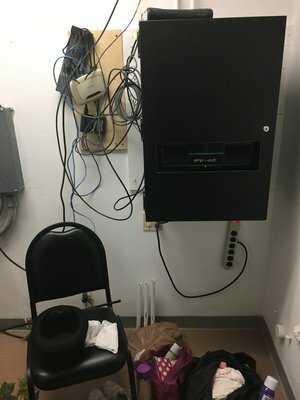 Has a reputation for responsibility- There is a saying in professional theatre that getting work is a combination of inspiration, perspiration, and reputation. A reputation for being on time, prepared, and the above points will keep you busy in theatre. As I reflect on these things I’ve learned and lived over the past nearly 10 years, I know that theatre has given me so much. Not every job is glamorous. Sometimes a job is that- a job. But, I do every job to the best of my ability, because it is my job, and I take pride in it. 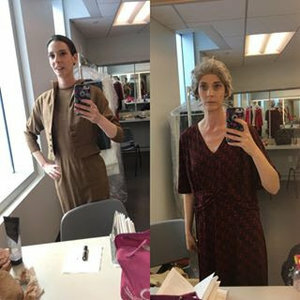 Below is a picture of me in Act 1 and Act 2 of the show I read in- great dressing rooms, great playing space. And, following, is a picture of the “dressing room” for the show I’m currently cast in (I had to bring my own mirror!). Helga in Kindertransport. Left, Act 1. Right, Act 2. Wherever you are, whatever your circumstances, do your best job. It will only reflect well on you. Be the actor with the good reputation, known for not only your skills onstage, but your reliability, responsibility and care for others. You’ll be glad for it.